I always learn something when I spend time with Mary Jane. 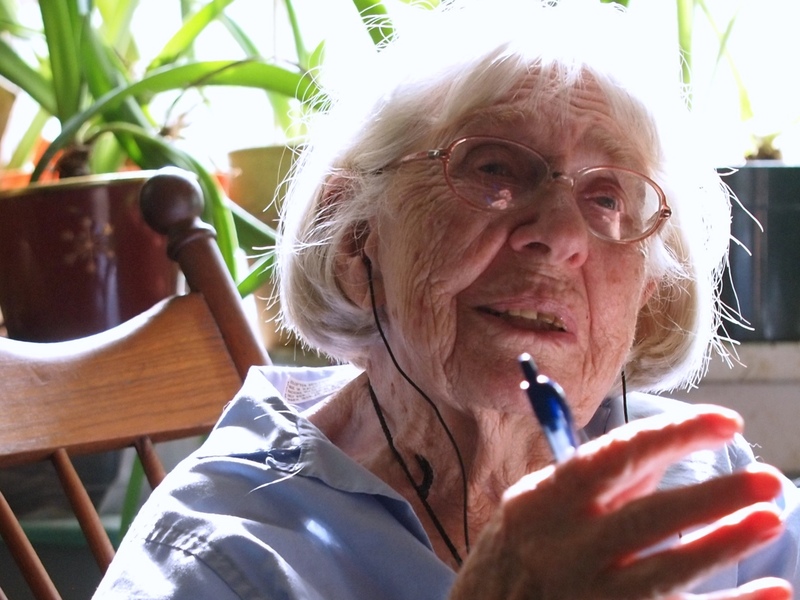 If you’ve read any of my blog you’ll know she’s my nearly 99-year-old neighbor. She has a place a little less than a mile from me on our country road. She loves her garden. She spends hours caring for it. It doesn’t look like your typical garden. The first time I saw it I thought it was an acre of weeds. I offered to mow it for her and she told me that she didn’t trust me to leave the good parts. She prefers to trim her garden with some folding hand shears while sitting on an overturned milk crate. The truth is that Mary Jane has an exhaustive knowledge of Ozark plant life. She knows what you can eat, what soothes your skin, what makes a good tea, and what can kill you. She knows what will have a beautiful blossom and what will attract or repel insects. Every year she moves in and out of the greenery with her shears, thinning and opening the space. When something special happens in the her garden, Mary Jane will give me a call and I will come over with my camera. 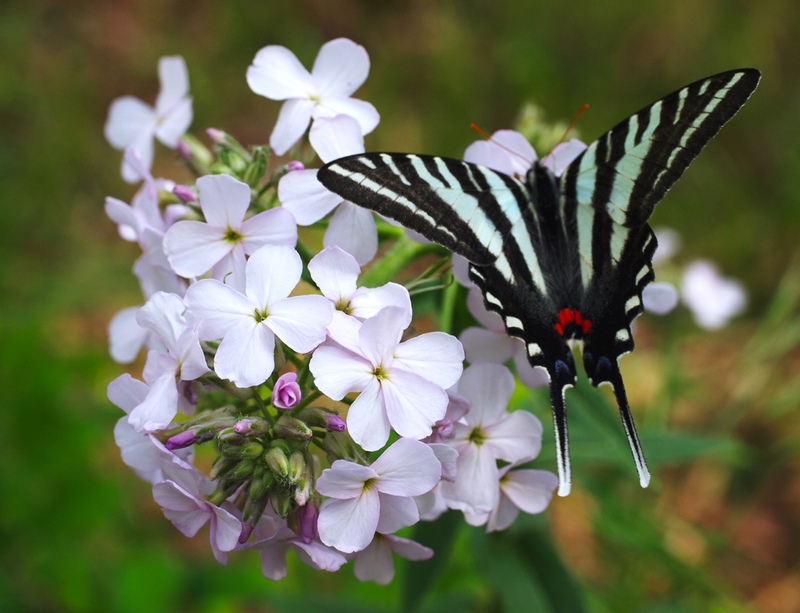 One of our rites of spring is the arrival of the swallowtails to feed on the sweet rocket. She will cut enough away to make a path to walk through and it makes shooting easy. One Saturday in April I got the call. I packed my long zoom and my macro lens and headed out. I started with the log zoom. I could easily get within 10 feet and my bird lens was just the ticket. 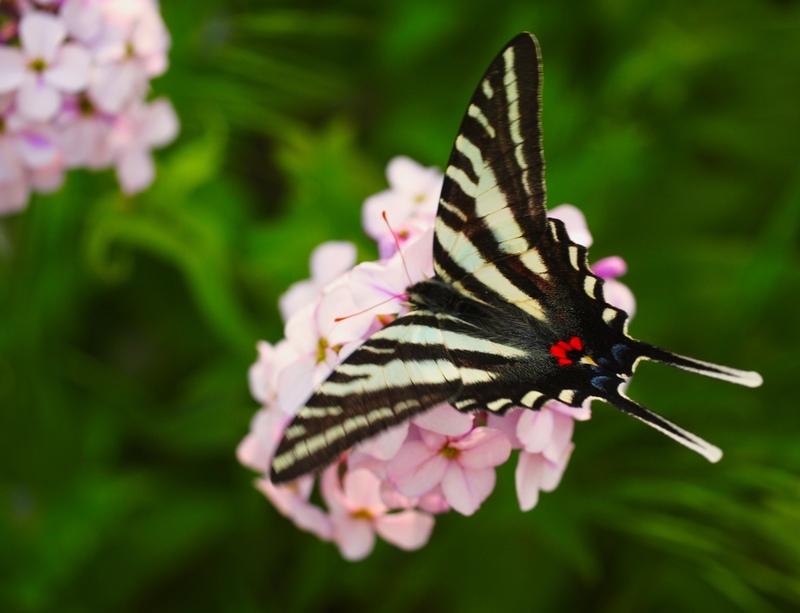 The swallowtails were so busy feeding that you could just find a spot and focus while waiting for a one to light. 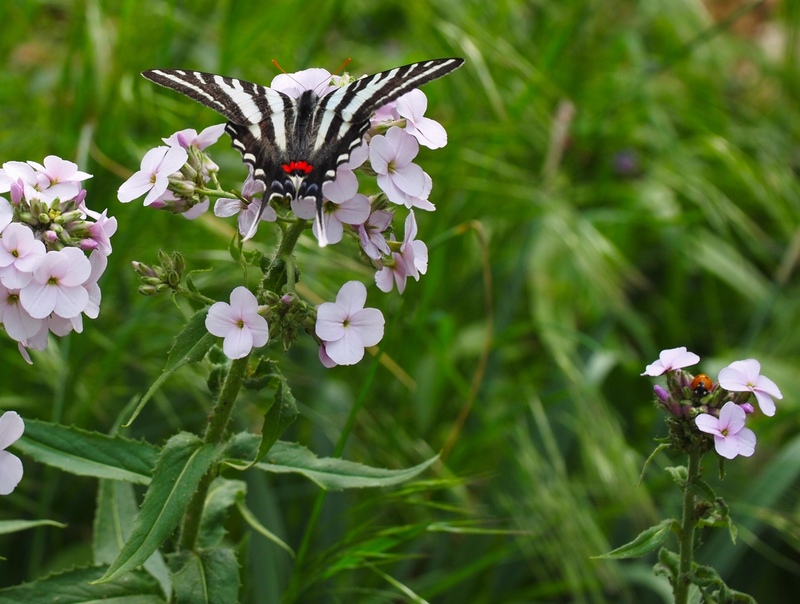 A tiger swallowtail feeding on mottled sweet rocket blossoms. 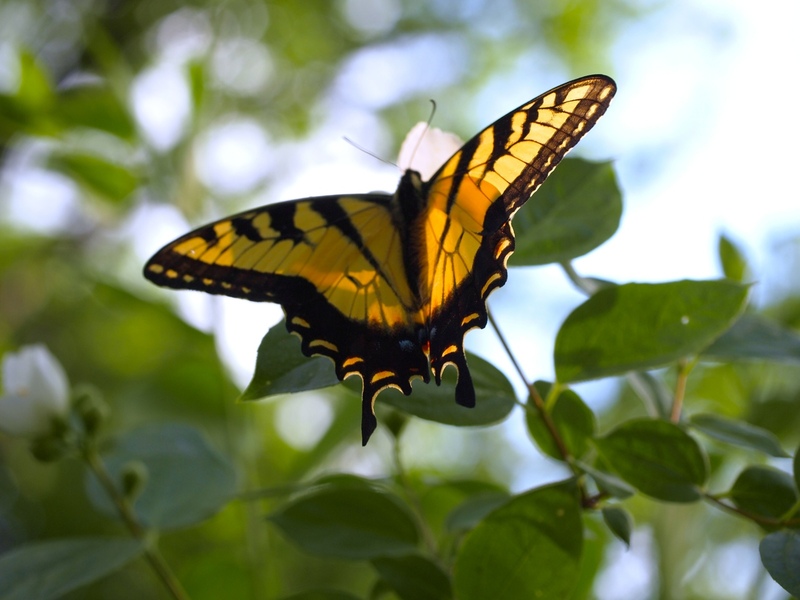 A tiger swallowtail with a spicebush swallowtail in the distance. 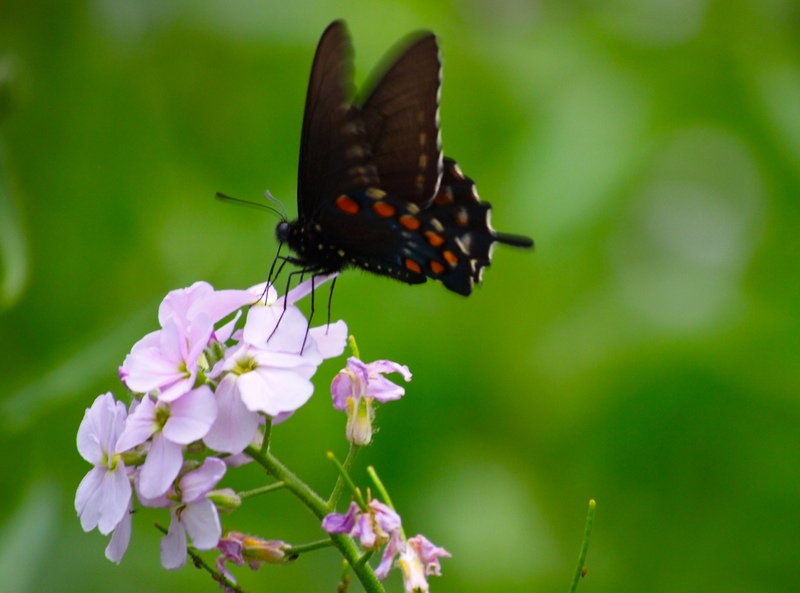 Spicebush swallowtail in the rocket. 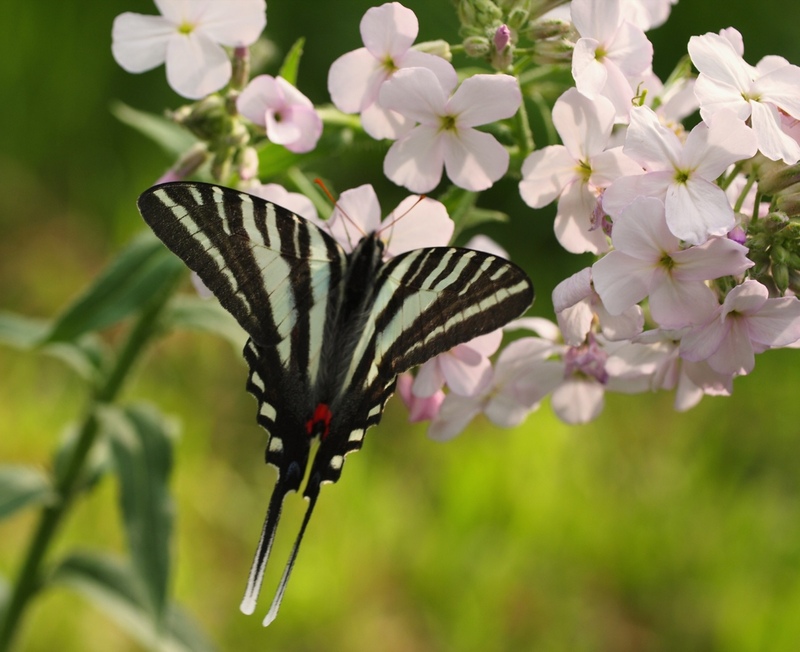 The swallowtail is the only butterfly that flutters while it feeds, this can make it a challenge to photograph them. After about a half hour shooting I noticed that Buffy, one of Mary Jane’s cats had followed me and was watching the scene. I decided to put away to zoom and see if I could get close to him. 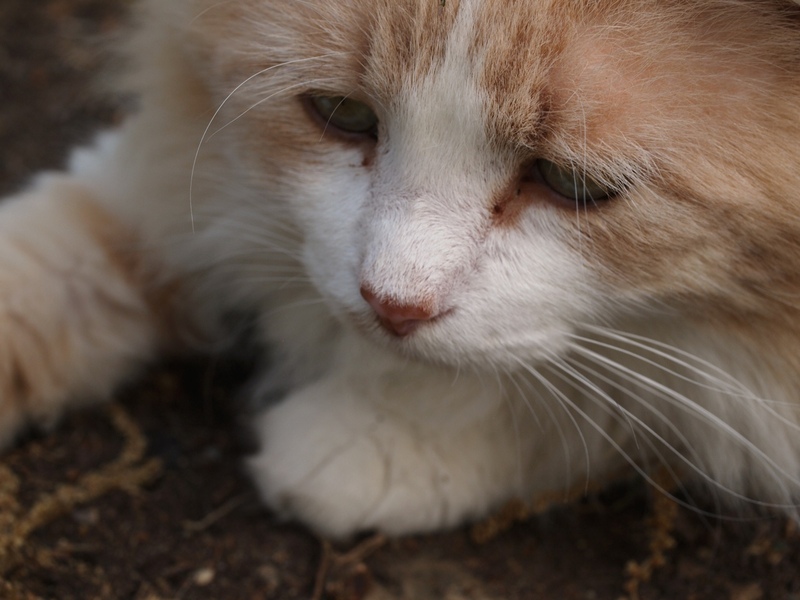 I took out the Macro – it can take a fair portrait. I was glad that I had changed lenses when I spotted this guy. He let me get incredibly close. 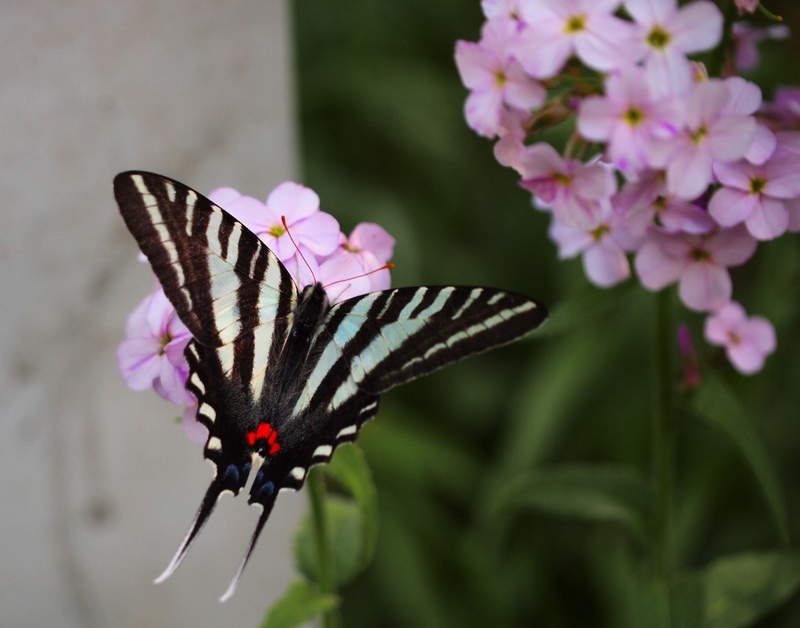 The zebra swallowtail was not bothered by me in the least. He moved methodically from flower to flower. I didn’t notice the ladybug on the right while I was shooting. Sometimes I can get so wrapped up in catching the shot of the insect that I forget how really special the sweet rocket is. The structure of this flower is really beautiful. 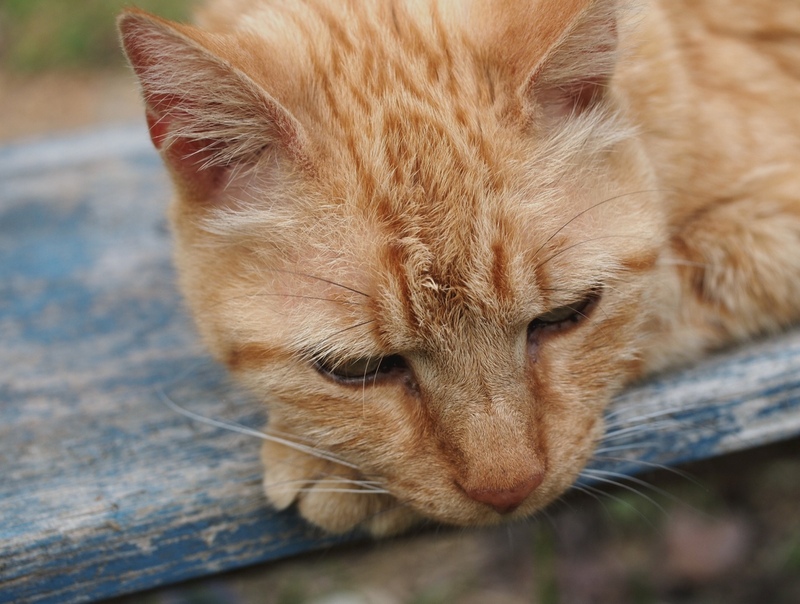 Tiger, another of Mary Jane’s cats, couldn’t have been more bored with it all. 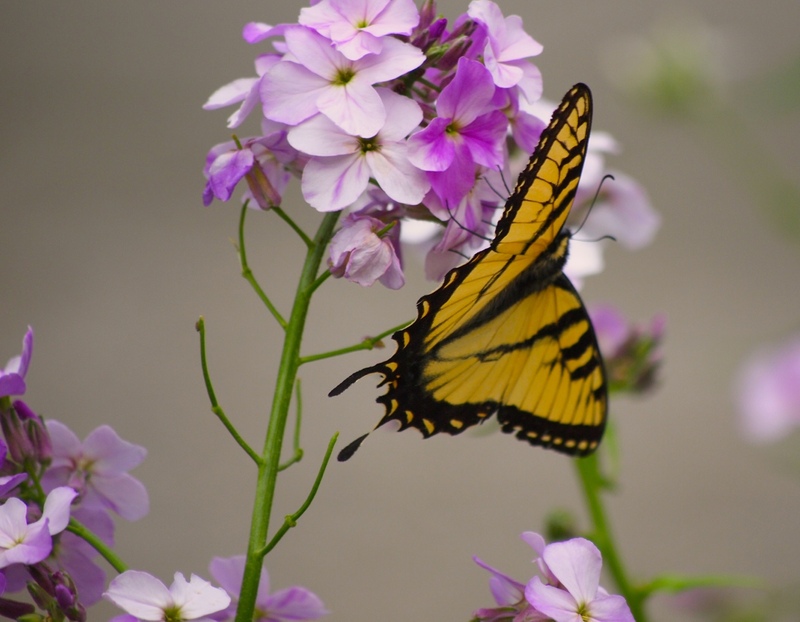 This sweet rocket butterfly garden lasted only a few days. Another of the Ozark’s micro seasons. 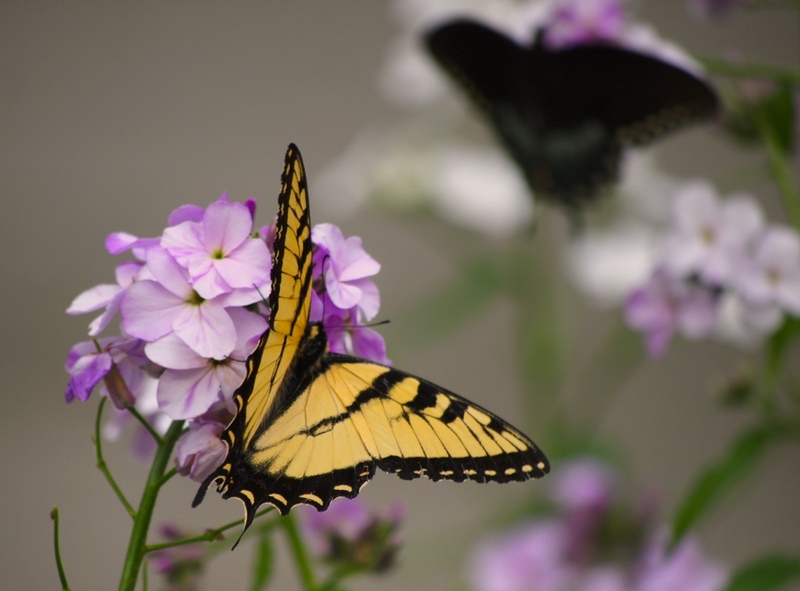 I thought the swallowtails were gone until next year. About a week later I got another call from Mary Jane. It was about noon, but I was at work and couldn’t get there for a few hours. Once I got there I had about an hour to shoot before dusk. 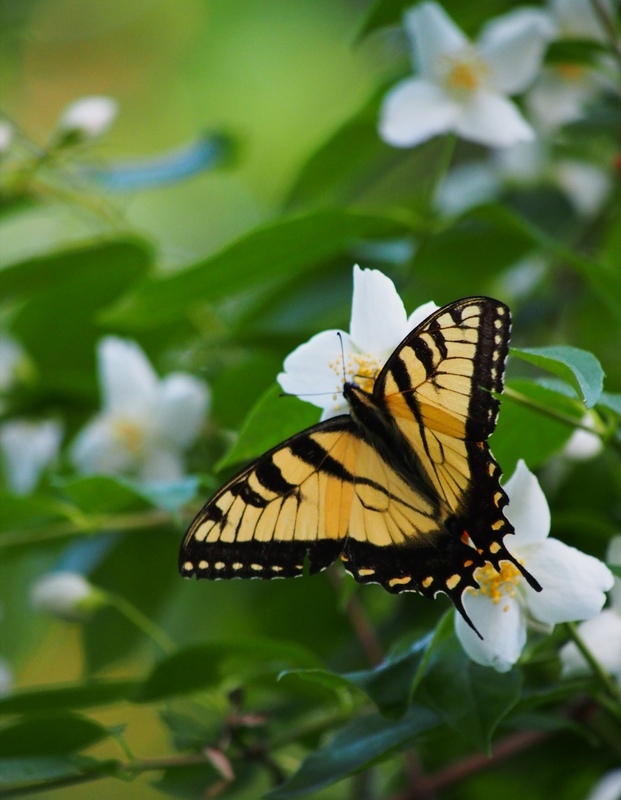 The swallowtails were back, this time at the mock orange bush, something Mary Jane planted to draw butterflies. She sees a garden as more than plants, it’s what the plants bring. This night I had to use the long zoom. 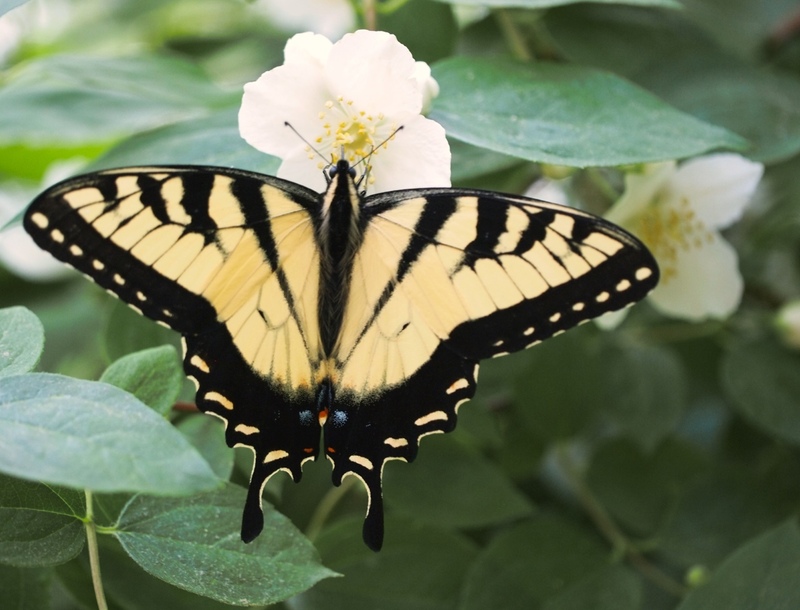 The mock orange was taller than me and these tiger swallowtails were easily spooked. Shooting upwards let me get some of the evening sky into some of the shots. 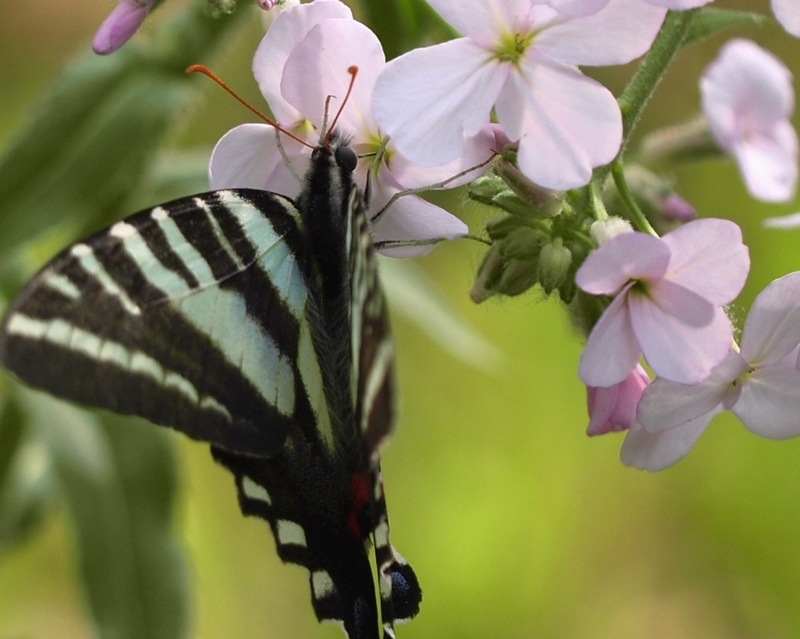 As the sun got lower the number of swallowtails really tapered off. 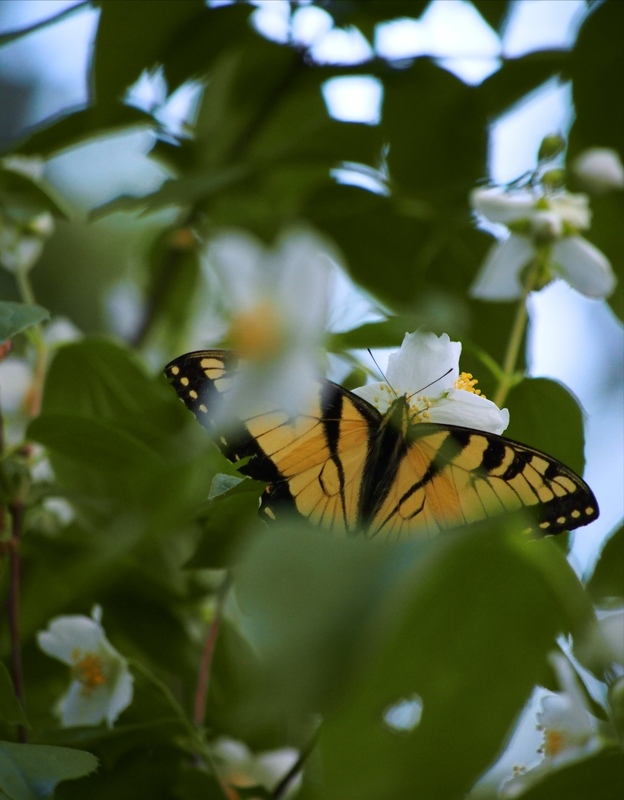 Towards the end of the evening the butterflies were in the interior of the mock orange. As the sun set we stood in the garden and Mary Jane pointed out what she would thin next, what was coming up, and what was blooming now. If I’m completely honest, I still couldn’t see it, it looked like weeds to me. I don’t have the vision. 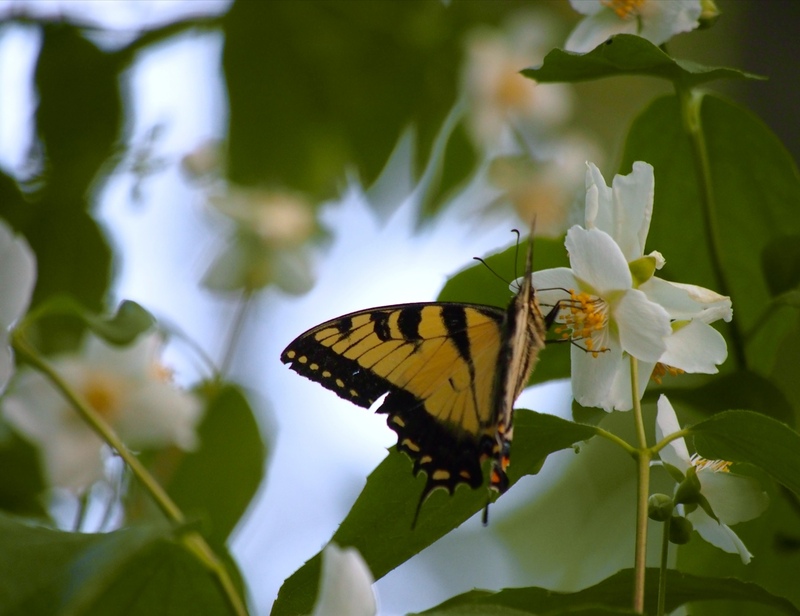 I looked back at the mock orange and asked Mary Jane if she knew where the butterflies went after sunset. She said they went to sleep. 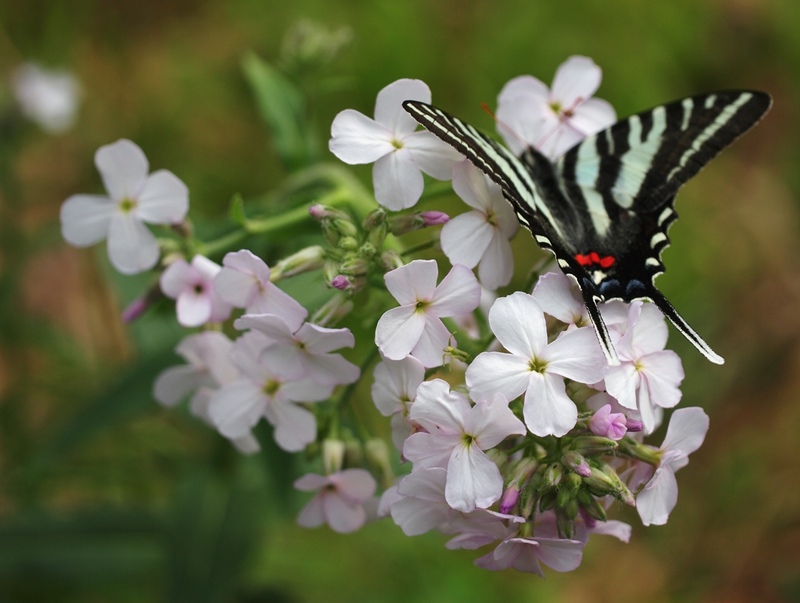 This entry was posted in insects, Macro Photography, Ozarks, Photography, wildflowers, wildlife and tagged butterflies, insects, mock orange, Olympus E-M5, photography, swallowtails, sweet rocket, wildflowers by artsifrtsy. Bookmark the permalink. Very nice! Thank you for sharing them! 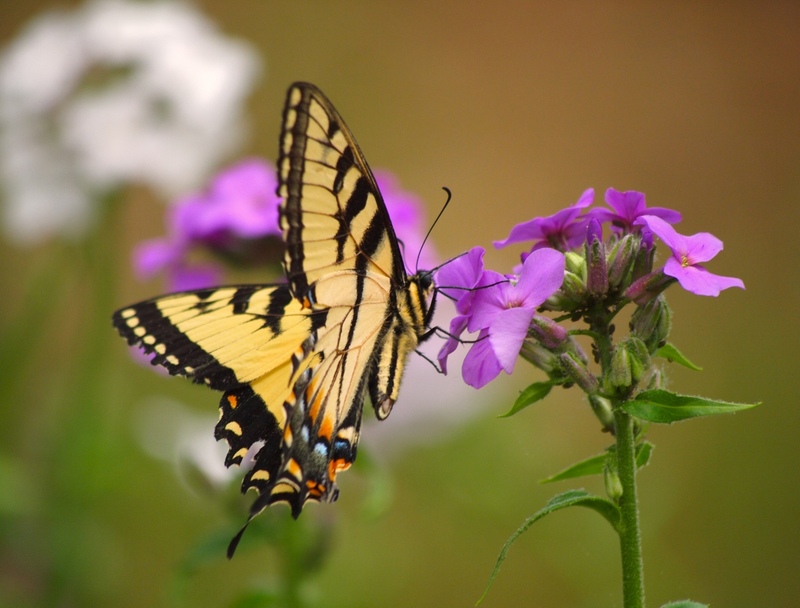 I love butterflies for their beauty and for the transformation they make to become that way. Wonderful symbolism. Thanks Russ – they are amazing creatures. So beautiful and so functional too. The transformation is amazing – it is a wonderful symbol. Beautiful shots and what a fantastic neighbour! 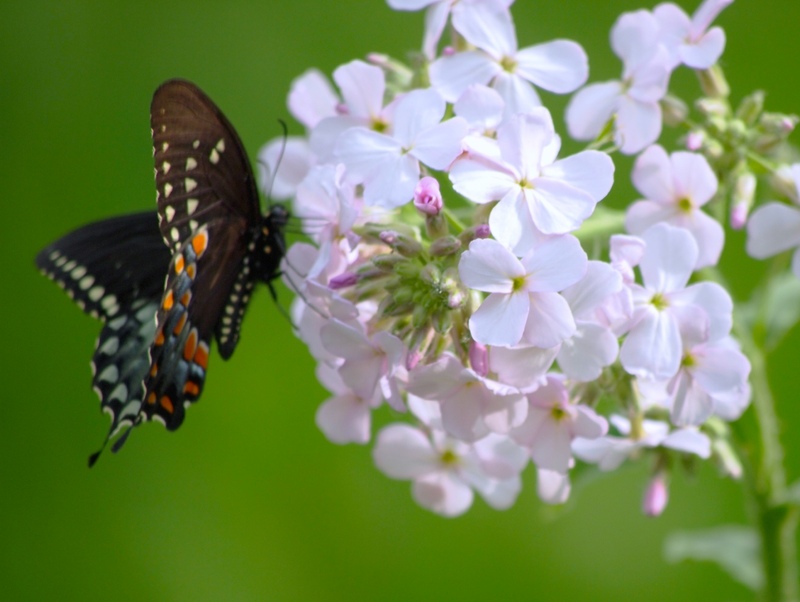 Thanks – I see the tigers and spicebush all the time. This wear the only zebra I saw this spring. Reblogged this on Vencentkung's Blog.